Of course I can’t condone using children as labour in any way and abhor the idea that any child misses out growing up in the security of a loving environment where they can learn through play and creativity. But what about getting them to help out at home? Is it immoral to make our children take on chores around the house? If so, how many chores are reasonable? And what about our responsibility to ensure they understand the value of money? How much you ask your children to help around the house is a matter for each parent to decide, but we do them no favours if we bring them up like little princes and princesses in the belief that someone else will always do the dirty work. If our children start to think that money appears like manna from heaven whenever they have a tantrum in a store they are unlikely to have a great work ethic as adults. If we put in some effort we reap the rewards and this is a lesson which I have attempted to get my children to take on from an early age. I was entrepreneurial from early childhood; making and selling or swapping things in the school playground. Today I see my own, and my friends, children wanting to start small businesses and why not? If they have the imagination to launch an enterprise lets encourage their ambition – all in moderation of course. 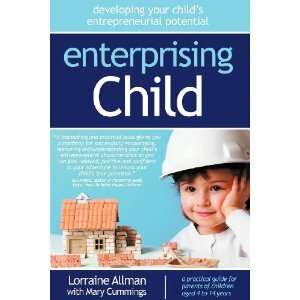 I was recently asked to contribute my thoughts on the subject for a new book called ENTERPRISING CHILD, by Lorraine Allman with Mary Cummings (www.enterprisingchild.com) . It’s a practical guide for parents of entrepreneurial children ages 4 to 14 years and if you find yourself with a toddler who shows signs of making their millions already, you might want to enlighten yourself. However beware, your offspring will possibly not want your help – us entrepreneurs are not good at taking advice, preferring to learn through our own mistakes! Laura, you were in many respects an entrepreneurial child, designing, making and selling clothes in your teens. How do you feel your parents influenced your decisions about work? My parents took little interest in my entrepreneurial spirit, but they did like me being productive and my mother certainly instilled a good work ethic into us. When, as a child, I found an interest in sewing, they encouraged me by giving me a sewing machine as a birthday present and the fabrics I needed for my hobby. I grew up in the countryside and had to make my own entertainment. My parents were quite frugal and pocket money was kept to a minimum. Finding ways to supplement the cash was a constant source of entertainment. My brothers and I would try anything to earn a little holiday money; from picking fruit, to selling strawberries on the main road or making cakes to sell to neighbours. Whilst my parents were encouraging with our activities they were quite surprised and concerned when I decided to turn my dressmaking ‘hobby’ into a way to earn a living – they would have preferred me to get a ‘proper job’. So whilst my parents did not actively encourage me to start my own business, my mother’s attitude to money and her instilling it’s value into me from a young age, has been hugely beneficial. How do you feel we as parents can encourage our children to have a similar work ethic – of not expecting things to be handed on a platter, so to speak? What top tips might you have for other parents keen to nurture a good work ethic? (Would you mind sharing with us how you encourage your sons in this regard)? I fully believe that not being spoilt is no bad thing. This is much harder nowadays when consumer spending is rife and peer pressure for our children to have the latest look can be demanding. I am not nearly as strict with my children as my parents were with us, simply because I do not want them to be ostracised, but I do try to encourage them to budget and save for things they really want. I encourage them to earn a little pocket money by doing chores around the house. Taking a Saturday job or doing a small business will hold them in good stead when it comes to running their finances in the future or even on the job market. I would far rather employ a graduate who has a proven work ethic than one who has been travelling around the world on his or her parents’ credit cards. My advice is to start teaching children how to deal with money from a young age. Pocket money could be given from as early as 5 years upwards. The amount could, for example, start at a low basic which could be taken away as a form of sanction. It could also be incremented if certain household chores are undertaken without complaint, for example clearing the table, sorting out bedrooms, folding the laundry etc. Each child should then be given a money box and a purse and the pocket money should be divided equally between the two. The purse is for spending – frivolous purchases such as sweets, stink bombs or comics whereas the money box could be a savings bank for the future. It is a good idea to have a savings goal. Children are more likely to put more money into the savings bank if they have a reason. So if they are saving up for a computer game and you work through the level they need to save each week to achieve their goal quicker – they may decide not to spend half their money on sweets! It’s a pretty simple idea, but it is amazing how few people believe in pocket money these days. Simply handing out cash on demand sets a really bad precedent. Simple trading – one man’s junk is another man’s treasure. CDs, video games, books and aspirational clothes are all easy to pass on to friends for a knock down price. Sweets can be purchased in bulk and sold on the school bus or in the playground (if permitted). Baking to order – bake some gorgeous cakes together with your children, which you can sell to the neighbours on a Friday night. They need to look and taste great and with any luck you can get regular orders from family and friends. Flower deliveries – take your children with you to a wholesale florist and buy up a stock of lovely flowers. Divide them up and wrap them artistically with brown paper and raffia bows. Offer them to the neighbours at a mark-up and suggest a weekly delivery. Every adult would appreciate help with cleaning and sweeping, possibly sorting out the shed or hosing out the wheelie bins. Help your child to make a short clear leaflet stating that you are happy to help with some chores but don’t state an hourly rate – suggest that you work for an hour and they should give you what they feel it is worth. This way you may well get paid for the effort you put in at a higher level than expected. This obviously might be restricted to family and friends that you know well, or alternatively, it might be something that time permitting, you do together during half-terms or the summer holidays. Music upload service – Help your child to set up a local service offering to upload CDs, Vinyls or tapes to an I-pad or computer or ask your clients for their play list and register them with Spotify, charge by number of uploaded tracks. Print leaflets and hand out to parents at the junior school gate. Make sure they see your children in uniform so they know you are serious and offer to do the work at their homes so that they do not need to give you their PCs to take away. DON’T FORGET – the franchise model for business. If your local service in the street works well don’t just stop there. Your business may not be scalable by you but you have the knowledge to train up your friends to do the same thing in their street, selling their product or service to friends and family. You may wish to keep the business under your name and umbrella giving your friends all the training and support they need (plus the stock in the case of the flowers or other delivery ideas). These business ideas are all great for scaling up! Obviously it makes sense that no child should put themselves into a vulnerable situation and where sensible, parents should make sure their children are working with friends or neighbours. It is also important to ensure your child does not get carried away with simply making money. It is very tempting to rank the business venture ahead of academic studies as I did throughout my childhood. Everything must be done in moderation.